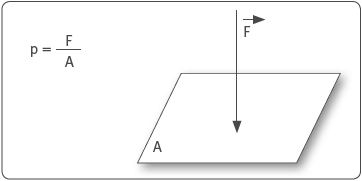 Pressure is the physical measurement of force per unit area and is often given in the SI unit Pascal [Pa]. Other units of measurement are also very widely used in pressure measurement technology. The automatic baseline correction means the sensors require no further calibration if they areused in indoor air applications. Three different types of pressure are generally considered in pressure measurement technology: absolute pressure, relative pressure and differential pressure. 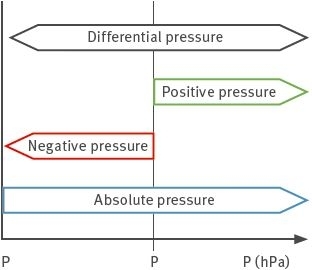 Differential pressure is the drop in pressure between two spaces with different absolute pressures. WHERE DOES ROTRONIC MEASURE DIFFERENTIAL PRESSURE? Cleanrooms, i.e. environments in which a very low level of contamination may prevail, are pressurized slightly. This positive pressure guarantees controlled removal of dirt particles from the room. To monitor this positive pressure, one needs pressure transmitters with a very high measuring accuracy and a very low pressure measurement range. Rotronic offers such instruments. HOW DOES ROTRONIC MEASURE DIFFERENTIAL PRESSURE? In this measurement technique, a heating element is placed between two temperature sensitive resistors. Due to a gas flow, the temperature profile is moved towards one of the resistors, which can be measured and evaluated. In this technique the pressure is converted into a force, which stretches a diaphragm and is measured by a piezo-resistive MEMS diaphragm sensor.